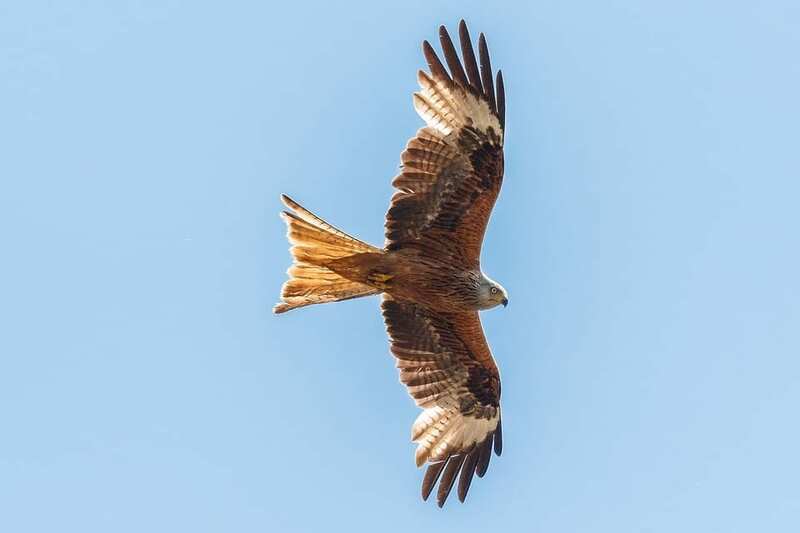 The red kite (Milvus milvus) is the recipient of one of Wales’ most successful reintroduction campaigns, instating the breed as something of an unofficial Welsh national treasure. When you cross the border from England to Wales, it is likely to be the first bird of prey that you spy, and, for beginner bird-spotters, they are one of the easiest to identify thanks to their distinctive forked-tail and colouring. Their plumage is a rich chestnut, shot with black, and their dark brown wings have recognisable white patches towards the tip. They have pale grey heads and bright-yellow legs. In Britain, the bird was pushed close to extinction due to extreme persecution between the 1800’s and mid-1900’s. Completely extinct in England and Scotland, a few breeding pairs clung on by the tip of their talons in the Cothi and Tywi valleys of mid-west Wales. Local landowners in these areas began an unofficial breeding programme, and so over the last 100 years their numbers have steadily increased, resulting in the extremely healthy population we have in Wales today. England and Scotland have followed suit, and there have been numerous red kite reintroduction programmes since 1989, which has seen vast improvements in their numbers beyond the Welsh border. Once, kites were considered the lowest of the low, and their carrion-crunching ways in Shakespeare’s London saw the great bard use the word ‘kite’ as an insult in some of his plays. They might have stolen the odd chicken, but the vehemence with which they were reviled was rather ill-deserved, as they pose no great threat to livestock. They scavenge carrion and prey on worms, small birds and small mammals. Red kites are thankfully now admired and treasured rather than seen as a pest, and today we are much more likely to associate the breed with wildness and freedom over death and disease. Red kites can thrive in a wide range of habitats, from woodlands, to moors, to wetlands. They usually mate for life, and build untidy nests from twigs in the high branches of trees, where they lay their eggs; usually 1-4 annually. They make formidable parents and ferociously protect their breeding sites—much more fiercely than their general territory—and females signal to their young to play dead should danger approach. Red kites have few predators, and most threats to their existence are related to human activity. They are no longer widely persecuted and their reintroduction programmes have been successful, but despite this their recovery is not guaranteed longevity. Pesticide use inhibits their breeding success, and poor land husbandry reduces their habitat. The health of the land is essential to maintain their numbers and keep these majestic birds in our skies. Any journey through Wales is likely produce a red kite sighting before long, to those with their eyes cast skyward and with keen eyes on fenceposts and telegraph poles, where red kites often sit and magisterially survey their kingdom. Look out for treetop ruckuses, as crows will often noisily mob red kites, making for an exciting opportunity to see some of the kites’ aeronautical moves; including a dramatic twist that sees them fly briefly upside-down, flashing their fearsome talons in warning to the pesky crows. For those wishing for a lengthier observation, there are several red kite centres and feeding stations in Wales. The nearest to Cambrian Wildwood is Bwlch Nant yr Arian, where twice-daily feeding takes place; a perfect opportunity to see an impressive and numerous squadron of red kites wheel and swoop.